A magical and emotionally charged journey into the heart of darkness that’s the Amazon jungle, this film is a must-see, writes TOBY WOOLLASTON. Is it perhaps too much of a coincidence that Amazon Studios have backed a film about exploring the Amazon? Surely not, although in the words of the film’s protagonist, “So much of life is a mystery my boy, we know so little of this world.” So, I guess we’ll never know. What I do know is that I’m glad Amazon did open their wallet for this production, otherwise we’d have missed out on a fantastic re-telling of explorer Major Percy Fawcett’s true story. The New Yorker staff writer David Grann has a penchant for uncovering true stories that have remained little known by the general public – keep an eye out for his Killers Of The Flower Moon to be directed by Martin Scorsese – and here, director James Gray has taken Grann’s book, The Lost City Of Z, and crafted an impeccably balanced film that dramatises Fawcett’s intriguing exploration into the unknown. It is a journey into the unchartered jungles of what was then labelled by England as Amazonia, an unforgiving region that guardedly held many secrets, which as the title suggests, may also be the possible location of a fabled lost city. On the surface it doesn’t seem the most original story to tell – you could be forgiven for assuming this might be a pulpy romp through the jungle swinging from vines in search for hidden treasure. Instead, we are treated to an emotionally charged film that is very much grounded in reality and in touch with its factual beginnings. The Lost City Of Z is an exploration into one man’s fortitude and an introspective investigation into his obsession with the journey up a remote river. Many parallels can be made with Joseph Conrad’s Heart Of Darkness, and in light of Apocalypse Now’s connections to Conrad’s book, it is no surprise that Gray has settled on a style straight out of the Francis Ford Coppola handbook of filmmaking… with perhaps a hint of Aronofsky’s The Fountain. 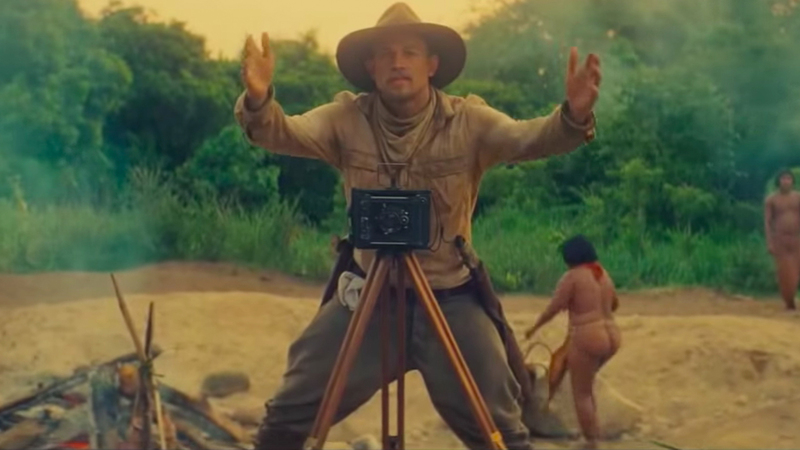 It is 1905 and Major Percy Fawcett (played by Charlie Hunnam) is commissioned to Bolivia on a cartography assignment. Despite being hungry for action, he reluctantly leaves his wife, Nina (Sienna Miller) and newborn child behind and sets off, naively proclaiming, “Mankind awaits our discoveries”. 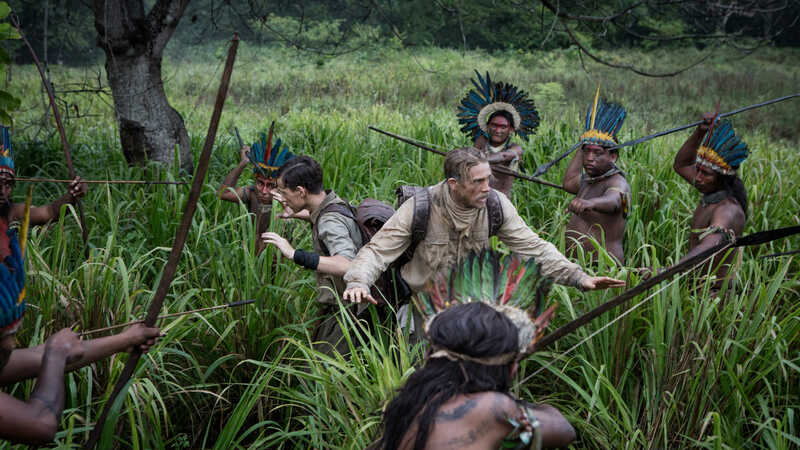 With help from Henry Costin (Robert Pattinson) and a small team of intrepid explorers they cautiously make their way up the Amazon towards the river’s source. The film provides some thrilling moments and ratchets tension superbly by employing a brooding and eerily discordant musical score that evokes a palpable sense of dread. It is by pure chance that Fawcett happens upon some pottery and other mysterious remnants of a long lost civilisation that prompts his return to England to prepare for another more thorough search. The lavish production values elevate this film beyond the ordinary and demonstrate many well-considered cinematic moments. But for all its technical proficiencies, the film’s true triumph is its ability to get under the skin like an Amazonian leech. This story could have been told in the staid traditions of so many period dramas. Here, James Gray subtly balances a heady mix of conventional filmmaking with a hint of magical realism that constantly threatens to send us adrift in Todorov’s The Fantastic without a paddle. The result is a genuinely thrilling film that is laced with just enough intrigue to prompt a post-viewing Google about the man and his expeditions.